Vegan Chili | how 'bout some cake? As soon as we got back from Hawaii I challenged myself to eat vegan six days a week. I hoped it would boost my energy, help me slim down, and improve my diet. In case you didn’t know, we Americans consume way more meat than we need. I’m not saying meat is bad; I’m just saying we don’t need it at every meal. Cutting back on meat is not only good for our health, but also the environment, so to me there’s a lot of incentive to try it. The first week was a breeze but now I’m starting to struggle. I don’t miss meat very much, but avoiding cheese and eggs is tough- especially as a baker! Still, I’ve managed to come up with some decent vegan meals. For example, this veggie chili is so hearty that I don’t even miss the meat. But I do miss the cheese and sour cream on top. It’s like eating cake without icing: good, but incomplete. If you’ve never made chili before, then you don’t know how easy it is. All you have to do is throw it in a pot and stir. It’s practically impossible to mess up. So that’s a good reason to try making this recipe even if you’re not trying to eliminate meat from your diet. Pro tip from my mom: using frozen ingredients instead of canned eliminates unnecessary sodium from the meal. That’s why I used fresh/frozen shrooms, carrots, and corn, although canned would have also worked fine. Start by pouring the olive oil in a large pot and turning the heat on medium high. 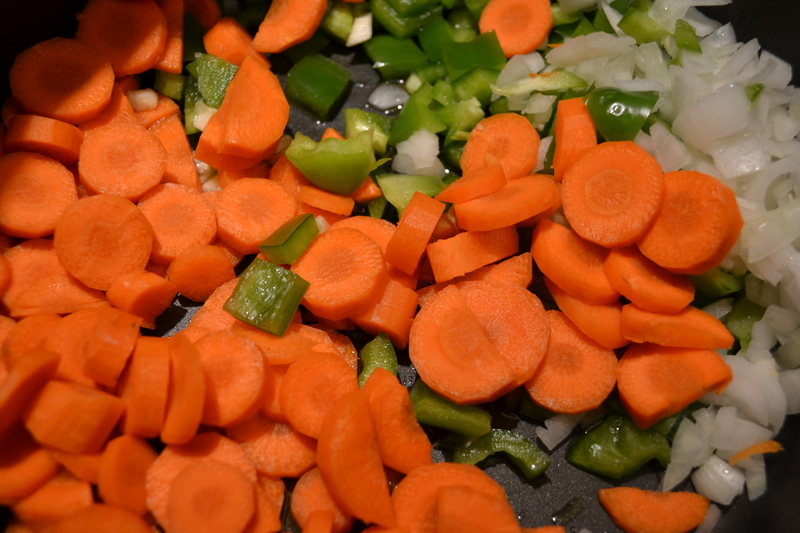 Add the garlic, chopped onion, pepper, and carrots. Since they’re all firm to start with, they need a little special attention. Sauté them together, stirring, until softened (5-10 minutes). This step smells really good! Then dump everything else in and stir. Cook for at least 30 minutes. Ta da! Chili. Chili for days, because it makes a big batch. Serve it on a bed of Fritos, topped with cheese and sour cream if you want it to taste good. Eat it plain if you’re trying to slim down. Looking for something a little beefier? 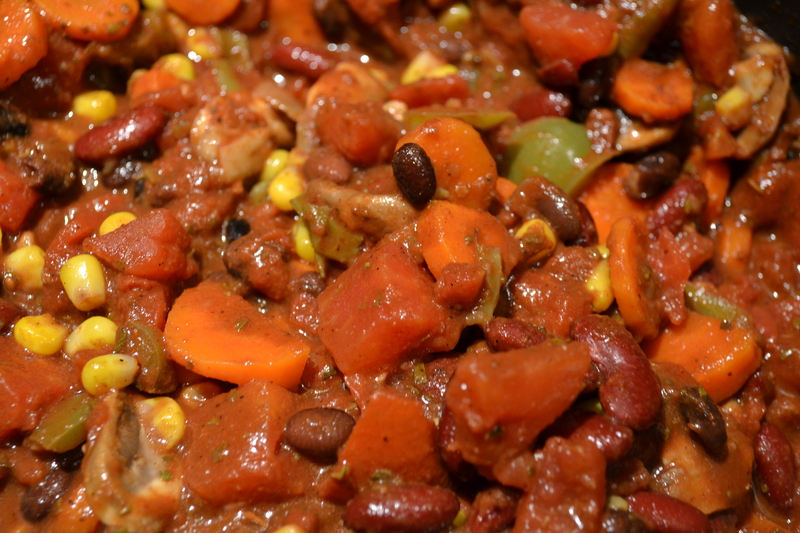 Check out my bison chili recipe here. This entry was posted in Food & Recipes, Healthy meals & snacks and tagged chili, healthy dinner recipe, recipe, vegan chili, vegan dinner recipe, vegetable chili. Bookmark the permalink. Oh my gosh, I tried being a vegan for about three months when I came to college. IT WAS SO HARD. Especially the dairy. Yesterday there was a segment on the Today Show about doing a “Meatless Monday” one night a week, which for me is more attainable. 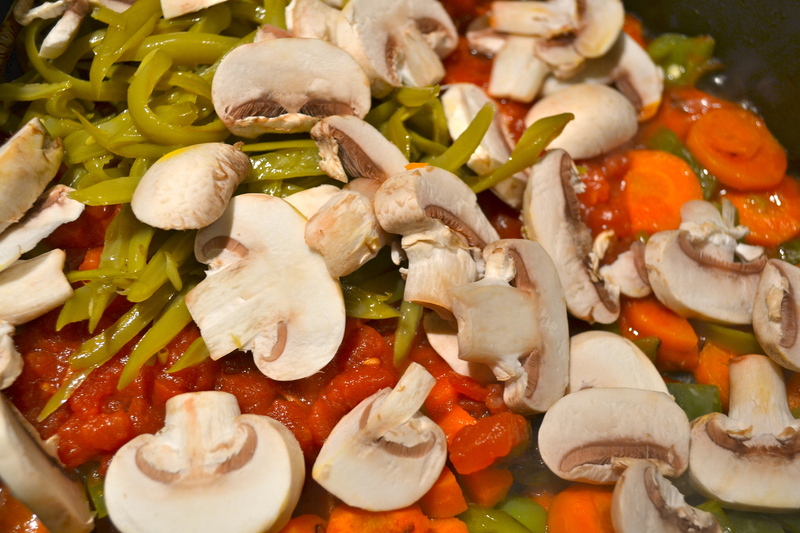 This recipe looks great – good luck on your veganism! I’ve never had vegan chili before, but I think I would like it by the looks of this recipe! I don’t think I could ever give up meat sadly though. This looks so good! I am not big on meat but I love cheese so being vegan would be really hard for me, but I want to try this one out. Yummy! I just pinned this to make later! <a href="”> My 300 Follower Giveaway! This recipe looks tasty! Good luck with the vegan adventure, I think cheese and eggs would be my weakness too! What a challenge… but that looks so delicious!! I will most definitely be giving this a try! Although I’m not vegan (or even vegetarian for that matter), I eat very little meat. Beef causes me to be sick and pork has a similar effect so I usually just stick to chicken if I’m having meat at all. This looks both healthy and delicious Rachel!